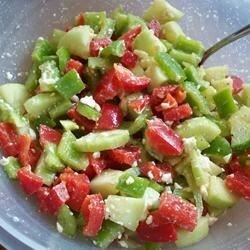 "This is a great salad for the summer heat. It is light and very quick to make. And even my kids like it. Serve with French bread for a great combination." Very nice! Next time I might try Italian dressing instead of the olive oil. Thank you! i thought this was just ok. I had this recipe at neighborhood block party last night and it was my favorite thing! So I looked here to see if I could find the recipe. Thank you!